There has been much discussion lately about economic development, ever since the Howard Government turned its attention to the capitalist potential of Indigenous communities and Aboriginal lands. As a result, policy and funding affecting Indigenous peoples have had a decided focus on economic development. The so called “economic rationalisation” policies that resulted (many of which were introduced with the trojan horse called the Northern Territory Emergency Response or NTER), emphasised Indigenous employment, included attempts to remove welfare (payments) for work programs (such as CDEP), and included the privatisation of Aboriginal housing and land. The Labor Government has roughly continued with this approach, supporting the dismantling of local community councils and increasing the emphasis on workforce readiness. But before any of these various policies appeared, Dominant Culture (DC) personnel working closely with Indigenous communites have long recognised the need to support economic development. Entities and programs devoted to business or enterprise development with Indigenous people began to noticably increase in number since around 2003. However, long before this, the Yolŋu people themselves had always worked towards economic independence. As part of what Berndt (2004) called the “adjustment movement” of the 1950’s, Yolŋu leaders took actions that they saw as a way of gaining independence, control to “exploit their own resources”, and to demand access to better education and skills training. These actions were highly misunderstood by the DC. As a result, today the question of how to achieve economic independence still weighs heavily on the minds of Yolŋu leaders. Why Warriors has been working to find ways to support Yolŋu people in economic development since we started in 2000. Recently we started the AHED Project as a community based service to facilitate economic development controlled by the people. It is from this experience that I would like to explain some of the dynamics at play in the economics in the remote communities of Arnhem Land. Not surprisingly, this discussion centres around the role of social security or welfare payments – the in-pouring of government monies. I also make suggestions about how in the current climate, government monies could be used more appropriately to support local development. 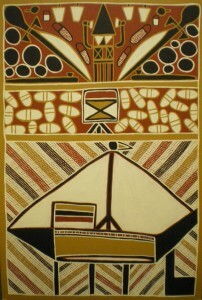 Let’s not forget that the Yolŋu people had a functional economy and system of trade prior to the arrival of Europeans. In fact, the international trade relationship that existed between the Yolŋu and the Macassans (from today’s Indonesia) was highly prized by the British who attempted to monopolise this trade. When the Macassans refused to trade on British terms and continued to trade with the Yolŋu, eventually the South Australian Government prevented the Macassans from returning . Prior to European arrival when Aboriginal trade routes extended right across Australia, Macassan iron and steel was traded right through to the southern states. Once this international trade was taken away from the Yolŋu, they were pushed onto the missions or cattle stations and could only work for rations. In Galiwin’ku, in addition to the usual rations, people received weekly monetary payments enough to buy a tin of syrup. Wages then gradually increased to about 10 pounds a week in Arnhem Land – still much lower than the award wage. The compulsary introduction of award wages that followed saw a dramatic increase in income for workers in the Arnhem Land communities – but it also resulted in a significant drop in the number of workers who could be paid on the existing income of the then missions. It was similar or worse on the cattle stations, resulting in a rise in unemployment all around. Families thus learnt in many cases to survive on the income of just one or two workers. However, because the income was considered high compared to the income they recieved prior to the award, there is little evidence that people felt they were only just surviving on their previous incomes; in fact many felt decidedly rich. In some places, unemployment benefits were introduced not long after the award wage. The funny thing is, it seems that the welfare payments were roughly equivalent to the wages received from the missions in east Arnhem Land prior to award wages. So, suddenly people without work were receiving what was very recently considered a good wage … and for doing nothing. So in this period we can see that economic rationalisations and policies were being implemented without considering the local economic circumstances or history. In fact, in Arnhem Land many elders argued against the introduction of welfare payments, because, they argued, it would make people lazy and discourage those who were working. The ill considered economic policy of this self-determination period did exactly this – it undermined the incentive of the award wage and those who previously were gaining a sense of fulfilment in working hard for their family. The additional impact to this was the influx of government workers and contractors through the 1980s, which ultimately displaced local jobs. As a result local unemployment soared. Not much has changed since then. The main drivers behind the economy of remote Aboriginal communities has become, and remains, government monies – either in the form of Centrelink payments, or government grants and contracts. It is largely an artificial economy. Understanding this better is the key to better economic policy for Indigenous communities – but more importantly, the key for Dominant Culture personnel to respond appropriately to local needs and initiatives. In the next article I will place the economics of these remote communities in the context of the wider Australian economy and Yolŋu family life. Economics of Remote Communities Part 5 - Building Indigenous economies from the ground up.